Blazing Wisdom is a non-sectarian Institute, respecting and supporting authentic teachings from all of the schools of Tibetan Buddhism. Tibetan Buddhism, for that matter, is not simply 'vajrayana' or tantric Buddhism, but the full integration of all major historical traditions of the Buddha's teachings, both sutra and tantra. Our commitment is to communicate the wisdom of this tradition in ways that are fresh, clear and contemporary, yet entirely based upon a deep and comprehensive grounding within it, and Tibetan language source materials. What has not been thoroughly understood and experienced cannot be transmitted. Without skill and adaptability in transmission, and masterful translation skills, the wisdom of the tradition can remain inaccessible. Our spiritual directors and executive director are authentic lineage holders with broad and deep, life-long educations in Tibetan Buddhism, and are deeply committed to sharing their knowledge and experience in manifold ways to benefit others. 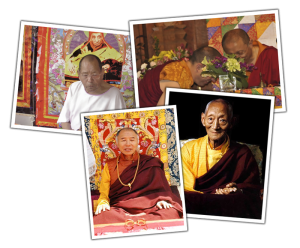 For that matter, Tulku Sherdor's principal teachers, including Tulku Urgyen Rinpoche and His Holiness Orgyen Kusum Lingpa, were widely acknowledged as genuine ecumenical masters in Tibet, with encyclopedic knowledge of oral and textual teachings. Others may be well-motivated to draw from Tibetan Buddhism particular skills or techniques or writings, and adapt them for use in a variety of pragmatic, educational or interesting ways. Our aspiration, however, is to preserve, protect and continue the tradition so that the lineage of awakened, compassionate masters can continue for many future generations.